This morning I had to throw my big plan for my first post out the window when I found out about this very important holiday. I just received my brand spanking new waffle iron yesterday. So, so exciting to my breakfast loving self. There I sat this morning perusing the internet for waffle recipes, while in the background I heard some Sprout characters (baby/toddler channel) singing “Happy Waffle Day!” I thought perhaps it was just a Sprout holiday, so I looked it up and to my joy, August 24th is indeed National Waffle Day. So serendipitous I thought that I had just received my new waffler, I am starting a breakfast themed blog, and it was Waffle Day! You can see why I had to scrap The Plan and make my first post about waffles. Note: Currently, I am dairy free due to my baby’s milk protein intolerance. Therefore, I use rice milk and Earth Balance soy/dairy free spread, in place of milk and butter in all of my cooking and baking and you cannot even tell the difference! In 1 medium bowl sift together flour, baking powder, cinnamon and salt. Set aside. In a second bowl use a wooden spoon to beat together the egg yolks and sugar until sugar is completely dissolved and eggs have turned a pale yellow. Add the vanilla extract, melted butter, and milk to the eggs and whisk to combine. Combine the egg-milk mixture with the flour mixture and whisk just until blended. Do not over mix. In third bowl, beat the egg whites with an electric mixer until soft peaks form, about 1 minute. 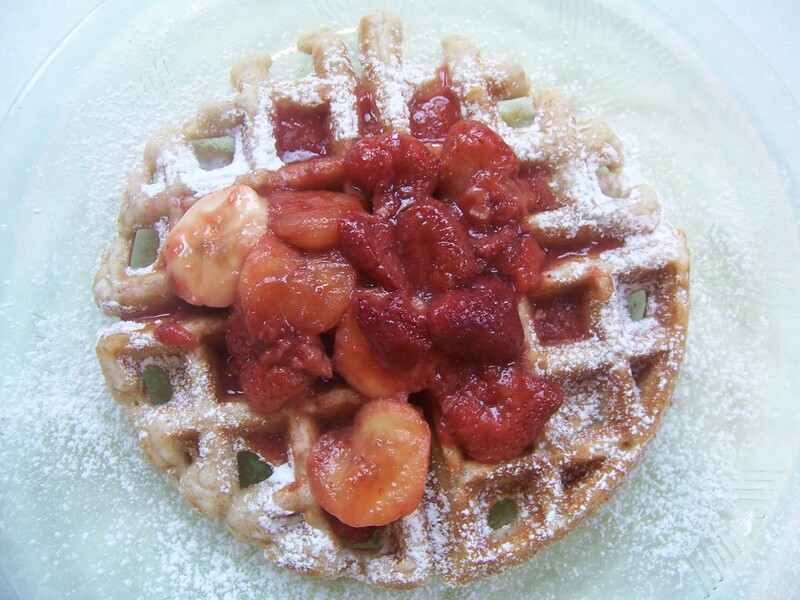 Using the rubber spatula, gently fold the egg whites into the waffle batter. Resist the urge to overmix. Heat strawberries and sugar in small saucepan over medium heat. Stir occasionally. Once strawberries have began to get hot and macerate mash them a bit with a fork. Once sauce is desired consistency add banana slices. Stir occasionally for a few minutes. 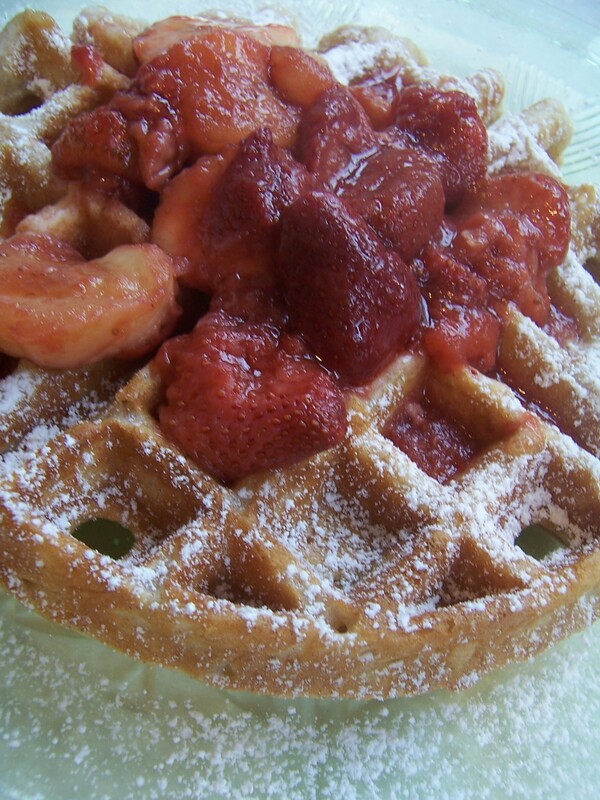 Remove from heat and serve on top of waffles sprinkled with powdered sugar. I can now finally read your blog!!!! Cara sent me your address….I love Emeril and don’t mind all the bowls especially when you get to eat all his yummy recipes! I really liked your muffin and I will follow your blog and try some of your recipes when I can!! !